Half a century of familial knowledge and a true love for plants has kept a family business blossoming in Salt Lake Valley. Ruth MacAngus was two years old when her father started Millcreek Gardens in Salt Lake. Fifty-two years later, Millcreek Gardens is family-owned and still going strong, and MacAngus continues the venture of her own successful empire. MacAngus’ father, Vernon Smith, began his career as a landscape architect. His clients began asking if they could buy the plants Smith used in his designs, and Millcreek Gardens was born. Growing up in the nursery business, Ruth and her five siblings helped tend the family business. MacAngus’ sister, LaRene Bautner, took over Millcreek Gardens in 1995 and suggested MacAngus start the nursery. Growing Empire Perennials and Nursery began as a production nursery for Millcreek Gardens. The nursery sits on one acre kitty-corner to Millcreek Gardens. The land is dotted with perennials, trees and shrubs and includes a wide selection of roses. They have a hoop house with a plastic cover, but no furnace. “We’re working with Mother Nature here,” MacAngus explained. 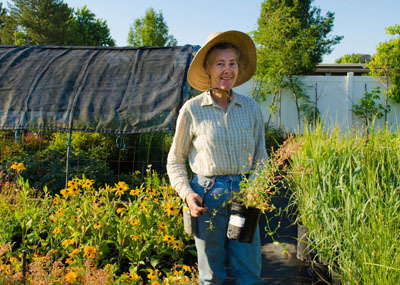 Black-Eyed Susans, Hibiscus and herbs are her favorite, but Growing Empire also has a variety of fruit and shade trees and several species that work well in the high desert of Utah, she said. In high school, MacAngus wanted to be a nurse, but now she spends her days tending to the welfare of shrubs, trees and flowers and works to help the plants grow healthy and strong. MacAngus suggests to those interested in growing their own plants to choose something pretty. At the end of MacAngus’ long days she’s most happy about seeing how happy her customers are with their new plants. Growing Empire Perennials and Nursery is located at 820 East Empire Road (3430 South). MacAngus and her plants are also a staple at the farmers market at Pioneer Park on Saturdays, the Park City farmers market on Sundays and the Murray farmers market on Fridays and Saturdays.